Montessori curriculum is based on the research and findings of Dr. Maria Montessori (1870 - 1952). Montessori evolved a philosophy of human development that would later spark major educational movements and influence child development approaches throughout the world. 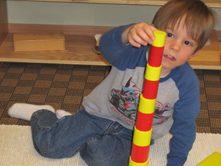 Montessori's method is structured around, and promotes, the child's natural, self-initiated impulse to become absorbed in an environment and to learn from it. 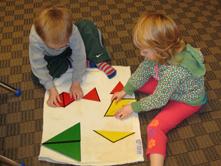 Based on her observations, Dr. Montessori developed specific materials, techniques and curriculum areas that assist each child in reaching his or her full potential. The Practical Life section lays the foundation for all other work to be done in the classroom. The activities are everyday tasks that a child needs to learn to master the care of self and care of the environment. Such activities include pouring, sweeping and tying, as well as grace and courtesy. The activities are presented to the child in such a way that concentration, coordination, independence and order are developed. toward understanding the abstract concepts they represent. 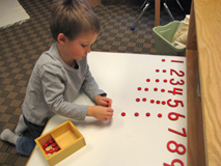 Mathematics in the Montessori classroom can be separated into a few major categories: beginning counting, advanced counting, the decimal system, rational numbers (fractions), and the operations of addition, multiplication, subtraction and division. Concepts are presented in a very concrete way so that children 3-6 are not only able to count, but skip count, square numbers and work with numbers in the thousands. Once the child has a firm foundation in the operations of addition, multiplication, subtraction and division, memorization of facts is introduced. 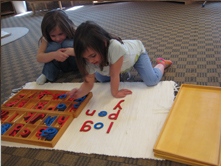 Montessori language curriculum is an integrated approach that combines phonetics and whole language. The child is first introduced to letters and sounds. After several sounds are mastered, he can begin to encode (spell) and decode (read) words by linking these sounds together. Words that do not follow the patterns or rules of the English language are presented as sight words. Once the child has gained confidence with his language skills, he can use it to enhance his studies in other areas of the classroom. He can read to research science, geography and history. He can write reports, sharing his learning with his peers. He can follow written recipes and instructions, and record his observations and results. A child of age 2 to 6 years old is concerned with absorbing the real world around him. The science materials present certain aspects of this world, in such a way that the child can observe, experiment, demonstrate and record what he has learned. The focus here is that the child learns how to be a scientist: objective, organized, able to perform tasks in a predetermined order, and record the results. He learns to classify, label and differentiate. Science is a hands-on activity that includes biology, botany, zoology, and physical science. The topic of Culture Studies integrates and emphasizes a region or population's geography, history, music, art, etc. The children study different areas of the world, and experience concrete examples of that area's language, literature, dress, food, artwork and music, both past and present. This increasingly important area introduces the child to our planet's great diversity of people. Kidsland provides an environment that encourages emotional, social, physical and academic skills to develop. The Kidsland child gains a positive attitude about himself/herself, school, other people and the world! This essential foundation ensures future success in learning and in life. We call such experience work.